On 4-16-2008 I had just taken off my boots for the evening. About 8:30 P.M. the phone rang. Susan Manning said she had received a call from Judy Monestier. 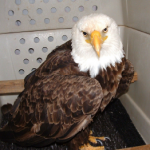 She had received a call from someone who had found a Bald Eagle in Fiddletown. 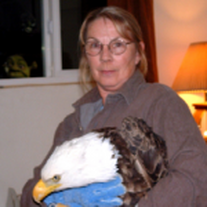 Judy has been a caregiver with Sierra Wildlife Rescue for a good many years. She is my mentor and has given TCWC a lot of good advice and encouragement. She is always there when you need an answer to any question and she has been extremely helpful in TCWC getting the “raptor” part of our permit. 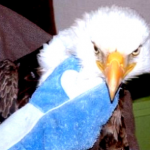 Judy had no way of knowing if this was really a Bald Eagle or something else. Susan and I have laughed about this before. But I put my boots back on and Steve and I headed to Plymouth. The young couple, Will Blake and Mandy Moore who had found the bird said they would meet us there. Now most people would not pick up a bird of this size and I wouldn’t advise anyone to do so. But they had already picked the bird up and were very careful to the way they handled it. I got out of the car and to my surprise it was a most beautiful adult Bald Eagle. 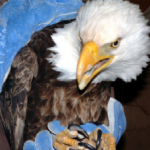 Now I have never seen an eagle this close, and to hold this bird was almost all the excitement I could take. I called Susan and she will tell you I could not control myself. I was on an eagle high!! The bird had been down for awhile and was very weak so it was not hard to handle. As soon as we got the bird back home, we examined it. Not finding anything obvious with it, we had to guess it was sick. We administered fluids and hoped for the best. I just couldn’t believe we had a Bald Eagle in the house. I had a hard time getting to sleep. I was very worried that it might not make it till morning. Morning came, and he did indeed make it through the night. Susan made several phone calls and soon called to tell us that we were to transport the bird to UCD raptor center. So without wasting any time, we were off to Davis. Brett checked the bird over, weighted him and he was quickly taken to the Veterinary Department for further tests. We had done all that we could do. Now we wait and keep our fingers crossed. Within a day, Brett called with the news. The bird had lead poisoning. He was very weak and we would just have to hope. They would treat him the best they could. In 2 days we received the bad news that he did not make it. I will always remember the excitement. 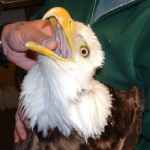 I may never hold a Bald Eagle again. You can rehab raptors for years and never have one. So I thank Judy and Susan for all the training and the fact that we were able to at least help him through another night. I have come down from my Eagle High! !